I have so much to catch you up on! Or maybe I should say catch my blog up on because I'm not too sure how many of you will be interested in following my pregnancy journey, but I can hope and pray most of you will! First, I have to start this off by giving a quick, but sincere thank you to everyone for your comments yesterday and all the comments on my instagram. I feel so fortunate to not only have my close friends and family, but all of you who make this whole experience so much better. I feel like I've "known" so many of you these past few years, and it's seriously wonderful to learn about pregnancy/motherhood and have a support group, of sorts, here through my blog. Thank you. Billy and I have always known we wanted kids, but it was never something we felt rushed to do. We didn't care about our age, when our friends decided to start trying, how many years we had been married, anything like that. Our number one goal was just to be on the same page together and begin the journey when we both felt ready. It was that simple and it was a decision we made, as a couple, without any outside factors determining our decision. We are definitely planners and wanted to be in a great place financially and personally before deciding to bring a little peanut into our world. Besides, we have had some of the most fun times/memories these past few years without little ones. We also wanted to get a lot of traveling in before, and definitely accomplished that (and plan to continue it!). We just knew the time was right for us (if you would've asked me this last summer-I would've told you I wasn't ready. It is just one of those things that you know when you know) and I couldn't be happier with the timing and how it has all come together! In short, my pregnancy has been nothing short of amazing. I'm enjoying being pregnant so much. I have actually felt much like my normal self for the past 12 weeks...zero morning sickness, energy levels have been the same, only a couple days with sore ta-ta's, minimal headaches, and I've been able to keep up with my workouts (I've just adjusted them slightly-like running slower and taking breaks often.) It's safe to say I feel so thankful about this and trust me when I say this isn't me bragging about it because there have definitely been days that I've cried my eyes out to Billy because I want to feel more. have more symptoms. and been worried that something might be wrong because I didn't realize it was possible to actually feel good during the first trimester. What do I think I'm having and will we find out the gender? Honestly, I go back and forth everyday. Some days I swear it's a girl, other days I think "well, it just HAS to be a boy because I've felt this good. Surely a girl (with my genes no less) would give me more trouble, right?!" As for our family and friends, everyone (minus my best friend Lindsay, Angela, and friend Cara) think it's a BOY. Some of our family members (looking at you Kev!) have even gone as far to give nicknames for the little babe, ha. Billy thinks boy as well! And YES! Absolutely YES we will be finding out the gender. We do have the option of getting it done early at 14 weeks, and as of right now this is our plan (which means it could be just another 3 weeks before we find out! Ahh!). Absolutely, how could I pass that up?! Patience is NOT my thing...I wanted to know like yesterday. **Probably my favorite moment so far: I actually had a very vivid dream during week 9 with my Mom in it. We were having a little gender reveal party and she was there with us for it (and in my dream-the baby reveal was a girl.) I woke up slightly in shock and turned to Billy and told him about it. I honestly took it as a sign from her and God that she IS in fact with me every step of this pregnancy and I really pray I have many more dreams with her in them. Remember how I've been a vegetarian for the past 3+ years? Right after I peed on those pregnancy sticks (four to be exact), I've been craving meat. Funny how that works, isn't it? I never thought that I would and sure enough it's happened. I decided from the beginning that I would eat meat when my body felt like it, but on the days it didn't I would continue on with my vegetarian lifestyle and that's exactly what I've done. I haven't been eating meat daily by any means, but maybe once or twice a week. I am still getting enough protein by eating lots of eggs, beans, and quinoa! I'm also craving any and all fruit (pineapple, grapes, and watermelon the most), fruit smoothies, and carbs like they are going out of stock at the grocery store (specifically soft pretzels and bagels). I cannot get enough fruit and carbs...gimme.gimme.gimme. That's about it though-I've had zero salty cravings and no aversions so far! How have the ultrasounds gone and what is baby K's heartbeat? As you can expect, the ultrasounds are even better than you'd ever imagine in your wildest dreams. We have had two so far and seeing baby K wiggle and move inside my body is basically the coolest and craziest thing ever. After our first ultrasound, we found out from my blood work that my thyroid levels were too low, so the doctor requested that I take medicine once a day and then re-check my levels again in a month. At first I was really worried because I have never had a thyroid problem in my life up until now, but my doctor reassured me it's common to develop with a pregnancy and is easily treated. Our ultrasound technicians have been so sweet and when pointing out baby K's body parts during our 2nd ultrasound we got a really good glimpse of his/hers nose and I immediately saw (what I thought) was MY nose. We will see if this ends up true, but I was pretty excited over it, ha! I also, of course, love that Billy is there with me at each appointment and is into it just as much as I am. Oh, and hearing the heartbeat just makes our heart explode into a million pieces. Baby K's heartbeat was 161 at our first ultrasound (at 7 weeks) and was 150 at our second ultrasound (at 10 weeks). Will I be doing weekly updates? I will be posting some sort of update every week for sure (definitely not everyday-just bare with me the next few posts so I can get caught up! ), and I love the "journal" type updates that everyone does so that I can track everything, but I'm not so sure I will be doing photos (at least the ones that look really good) weekly with them! To be honest, I hate having my picture taken and I'm lazy when it comes to it. We will see what I can come up with but yes, I'm really excited to post updates throughout this process! 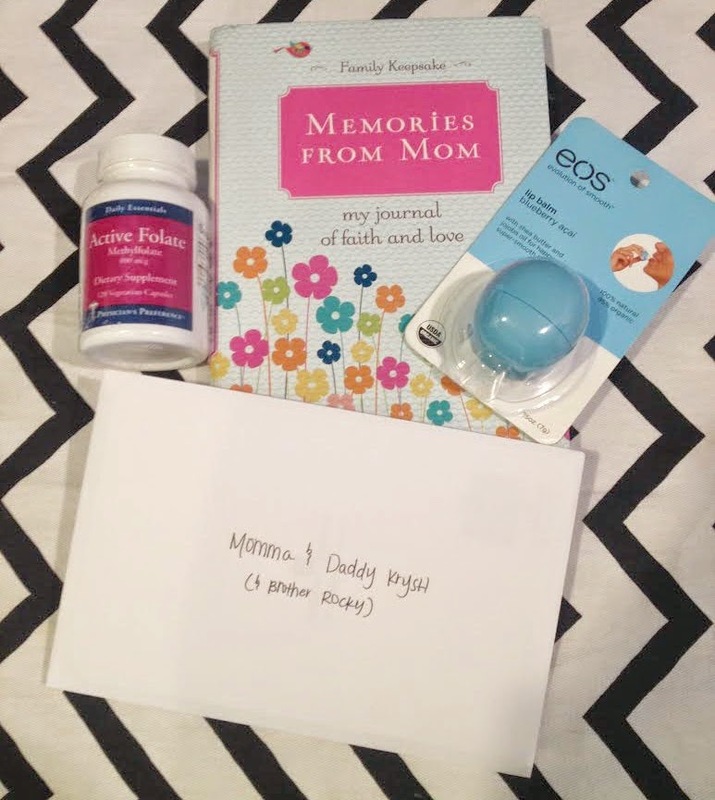 I also want to make sure I include as much info as possible (for those who might be pregnant in the future-I know I loved bookmarking thing/baby must haves before we found out! ), but I will say as of right now my shopping the past few months has been pretty non-existent. For both me and baby. We've bought a couple cute things for baby, but that's about it. Has Billy been the most supportive and loving husband ever during this time? Of course I had to throw in a special shout out to my other half in this journey. Billy is a true champ. He has been so supportive, loving, and patient. Even if he is super busy at work, he manages to make it to our appointments and it means so much to have him by my side. 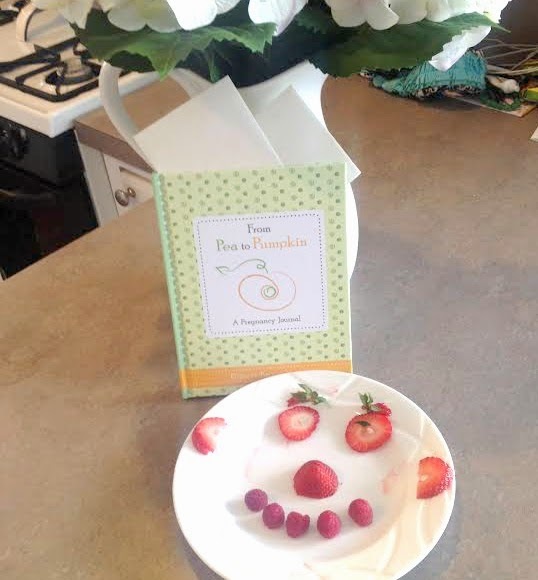 At the beginning, he loved calling baby K by the size of the fruit it was that week ("how's our baby raspberry doing today? ", and I melt when he rubs my belly and says good morning to baby. His sense of humor and commentary at our doctors appointments always wash away any worries I have and I know he is going to be the best Daddy in the world. Phew, props to those who made it this far! I hope I didn't bore you all to death. It's so much fun to follow along with other pregnant ladies while I am, its like a little support group! Can't wait to follow along on your journey! You're so lucky to have a good first trimester without morning sickness!! So happy for you pretty mama! :) Love that your hubs has been able to go to all of your appointments, that's so sweet! I can't wait to follow your journey. 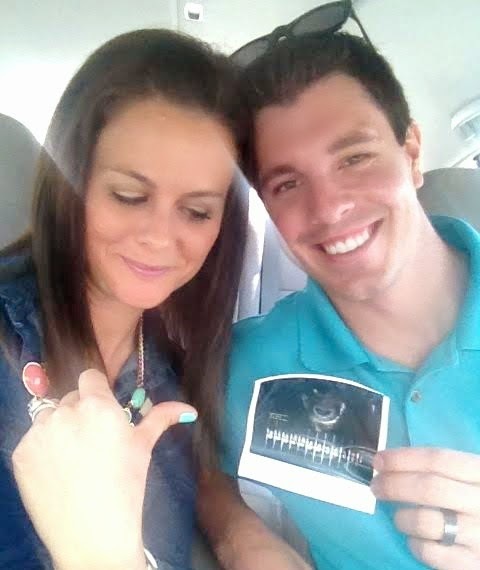 You and Billy are too cute and I know Baby K will be too! So fun. I'm excited for you! so glad to hear you've been feeling well! I'm having a boy and am on week 23 of all day nausea :) finding out the gender was definitely one of the highlights for us so far! 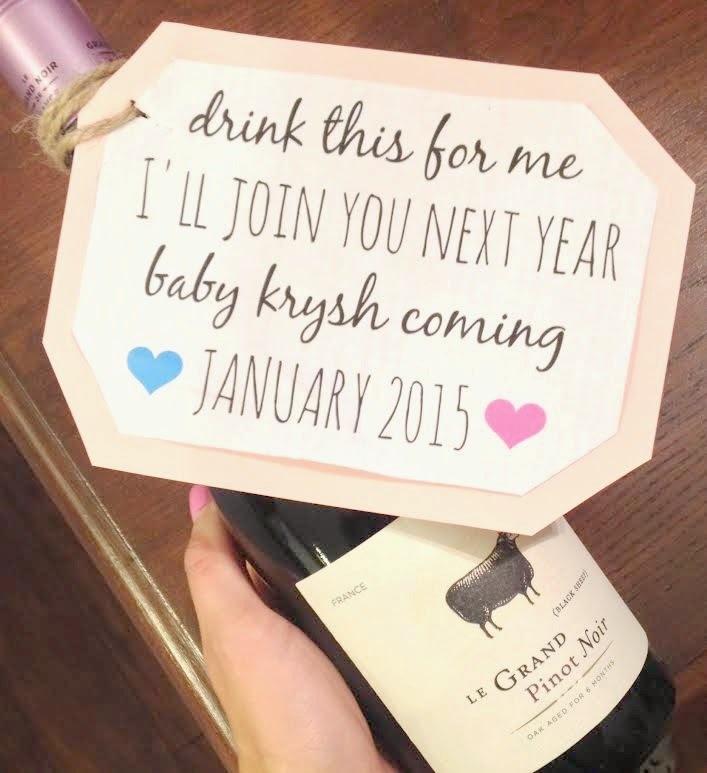 I love the wine bottle announcement! And feel free to share all you want, I love to hear pregnancy stories!! So happy for you Katie. Loved reading this! I'm so excited for you! I had an awesome pregnancy, sounds similar to yours, no sickness, minimal headaches, and kept wondering if something was off too! I attributed my healthy eating and lifestyle as well :) AND I ended up having a girl, and my best friend has been sick as a dog and is having a boy, so those old wives tales aren't always true! I'm so excited to read about all of your adventures and follow along on this wonderful, crazy ride! Your pictures were beautiful and I know you'll make awesome parents! Love this! And I did make it through the whole post ;) I am a new follower, can't wait to share in your journey! I had was tiredness and I found out I had low iron about 4 months in. I crave tons of fruit too! Enjoy it all! Congratulations! I’m super excited to follow your journey. And major props to you for tactfully addressing when you (and Billy) chose to get pregnant. All the Instagram comparisons to @mrsstephhoward were insane. Don’t get me wrong. I think Stephanie is great. I follow her and your blogs daily. But all I kept thinking was…people, let Katie have her day! Seriously, keeping pregnangy a secret is the hardest part! You just want to scream it from a mountain top!! And my friend that's a vegan started craving meat when she got pregnant too! So funny!! I'm so excited to hear more about your pregnancy! Sounds like it has been comfortable for you, so that is great!! I loved every part! How exciting! Can't wait to follow the journey. Congratulations! That announcement is the cutest thing ever!! Love it! And can't wait to follow your weekly updates! So happy to hear you are feeling well! I am 32 weeks along and also have had an amazing pregnancy. No morning sickness (thank goodness as I ride public transportation to work everyday!) In fact I was feeling so awesome we didn't find out until I was 9 weeks! Oops! So all those old wivestales are just that. Because we are having a girl (even though my mom swore up and down it was a boy because of the Chinese birth chart!) So excited to follow you along lady! Yay, loved this update Katie! I felt the same way, once the news was out it was such a relief to be able to share all the details and it sounds like we've had really similar pregnancies so far! My mom was super sick with both my sister and I, so I always anticipated that pregnancy was going to be really rough...but my first trimester was a breeze and I felt great too! Such a blessing for sure! Looking forward to following along with your pregnancy updates - also, I'm super jealous you're finding out the gender so early! We are not finding out until 20 weeks so we still have a few weeks to wait and it's killing me! I'll be interested to see what we're each having! Congrats! I'm due with baby number two the week of Christmas so it will be fun to follow along on this journey with you. I am guessing boy because it sounds exactly like my first pregnancy. We love the surprise so I will not know what we are having until December, but after reading your experience I am starting to think girl for me because I have been the exact opposite (even though it is impossible for me to imagine anything other than "it's a boy" being said in the delivery room). Your announcement did motivate me to finally get back to the gym though yesterday, because I noticed you had been working out all along. I gave myself permission to take the first trimester off due to a previous miscarriage, but it was nice to get back. Hope you continue to feel well! Congratulations on your exciting news!! I felt GREAT through my first pregnancy and I had a baby girl...got sick the 2nd go around, and had a boy! I would have never guessed! :) I can't wait to read about your updates, I've been a long time blog reader and it's so exciting to watch people go into their journey of parenthood! It is the absolute BEST Thing you will ever do in life!! Congrats and God bless! I know I'll be following along! So excited for you! I can't wait to read every one of these baby updates! Oh my gosh I just found a similar wine tag the other day on Etsy & I told my best friend that she (well, I want to know too, ha!) is going to have to do this for her next baby! This is all so, so, so exciting!!! Congratulations!! I cannot wait to read allll about Baby Krysh so don't be apologizing to anyone!! This is YOUR blog... a place to document anything & everything you want!! Again, really can't wait to read more & follow you along on this amazing journey!! Just curious, how early on did you find out? Of course I’m not pregnant and tear up all the time, so reading this made me multiple times! You are going to be the cutest pregnant lady and rock that bump! I (duh) can’t wait to follow along and LOVE how you shared with family and friends. Such a cut idea and totally bookmarking that for the future....! Wait, do I not follow you on instagram?! I missed the initial announcement, I'm gonna have to go double check on that. So excited for you! Hubby and I are trying right now so I'm probably going to be living vicariously through you until I get my own two lines on that stick! Congratulations, lady! I can't wait to follow along with all your updates! I'm 37 weeks pregnant and time really does fly! Fruit has definitely been my number 1 craving this whole pregnancy! So glad you had a great trimester- it really makes everything better! 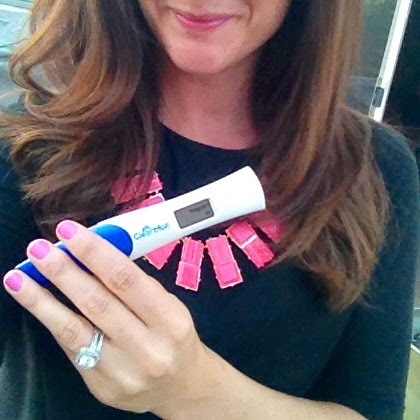 Something is in the water.. Everyone I know has announced a pregnancy lately! Can't wait to see what next few months holds for you! Also can't wait for these announcement videos I love those. It will entertain me while I'm in the airport tomorrow! Congratulations! I'm super jealous of people who feel good while pregnant ;). I'm excited to follow along with your pregnancy! I swear everyone I know that is pregnant right now (including me) is having a boy. I have felt so good all through my pregnancy so far and I'm 23 weeks and counting. It's definitely a blessing not to be sick! Congrats to you & Billy.. I am so happy for you both! CONGRATULATIONS again gorgeous mama to be!! Congrats!! My pregnancy was super easy - only issue I had was dizziness at the beginning!! Pregnancy is such a fun amazing journey and I miss it already! Ha! Having a supportive partner is so important. I love that Billy is there for you! What a sweet dream with your mom- I had a few with my mom in them when I was pregnant, and each time it was such a comfort! That is totally a sign that she is right there with you, sweet girl!!! Hugs to you and I'm so happy for you and your little growing family :) Having a baby is the best thing ever! Also, about the first trimester feeling great, I'm right there with you! I never experience morning sickness (thank God!) and I just think we're the lucky ones. ;) You never know though, I'm sure the next pregnancy I'll suffer like crazy from it! Ha! Every baby and pregnancy is different! Congratulations to you, Billy, and your families!